"As the ponies all prepare for another Hearth's Warming, families come together to celebrate the big holiday. The Pie family arrives in Ponyville and Pinkie Pie, Fluttershy, Applejack, Rarity and Rainbow Dash are ready for the big day... but Princess Twilight Sparkle doesn't have time to celebrate! With her new school taking up her time and Shining Armor, Cadance and Baby Flurry Heart coming to visit, Twilight is behind on her to-do list. She hasn't even begun to shop! Luckily her friends are here to help! Instead of one gift for every pony, they decide to do a Hearthswarming Helper and give just one gift to the pony whose cutie mark they pull out of Applejack's hat. But now, the pressure's on to find the one perfect gift to make each pony's holiday special. 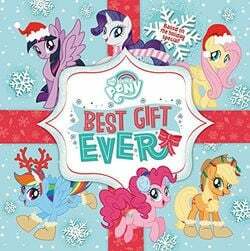 By seeking help from their friends all over Equestria, the Mane 6 and Spike are each hoping to find the best gift ever. With their hopes high, they set out on a magical adventure to make each pony's Hearthswarming bright."